Football season has officially kicked off and that also means the official start of Fall in my book. 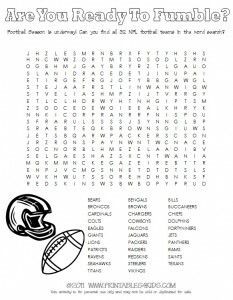 Can you find all 32 NFL team names in this fun and challenging football word search? This one is pretty challenging – but I think you are up to it! There are some football pictures you can color in as well. Click on the image above to view and print the football word search full size. PS – this football wordsearch is perfect for putting out for the grown ups at your next football party, challenge your scout troop or feel free to use it in the classroom, too!